The truth behind this story is much more interesting than is generally realised, not least because it has a fascinating twist. 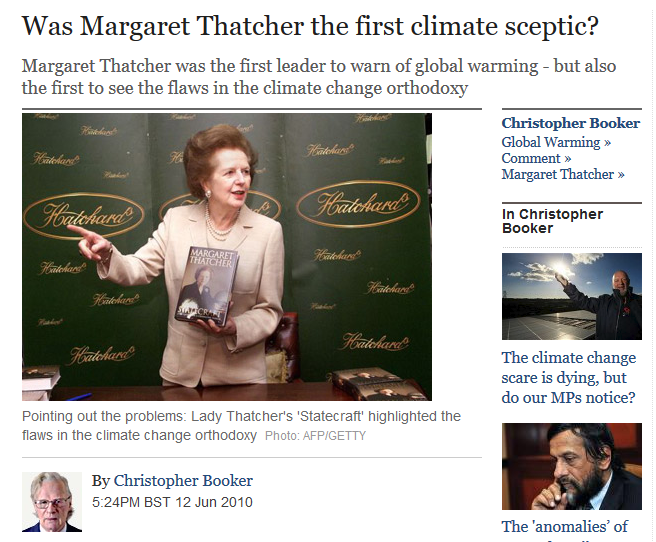 Certainly, Mrs Thatcher was the first world leader to voice alarm over global warming, back in 1988, With her scientific background, she had fallen under the spell of Sir Crispin Tickell, then our man at the UN. 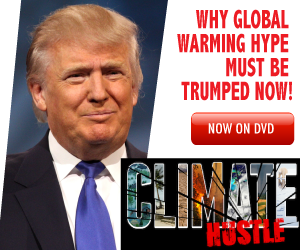 In the 1970s, he had written a book warning that the world was cooling, but he had since become an ardent convert to the belief that it was warming, Under his influence, as she recorded in her memoirs, she made a series of speeches, in Britain and to world bodies, calling for urgent international action, and citing evidence given to the US Senate by the arch-alarmist Jim Hansen, head of Nasa’s Goddard Institute for Space Studies. In bringing this about, Mrs Thatcher played an important part. It is not widely appreciated, however, that there was a dramatic twist to her story. In 2003, towards the end of her last book, Statecraft, in a passage headed “Hot Air and Global Warming”, she issued what amounts to an almost complete recantation of her earlier views. In other words, long before it became fashionable, Lady Thatcher was converted to the view of those who, on both scientific and political grounds, are profoundly sceptical of the climate change ideology. Alas, what she set in train earlier continues to exercise its baleful influence to this day. But the fact that she became one of the first and most prominent of “climate sceptics” has been almost entirely buried from view.